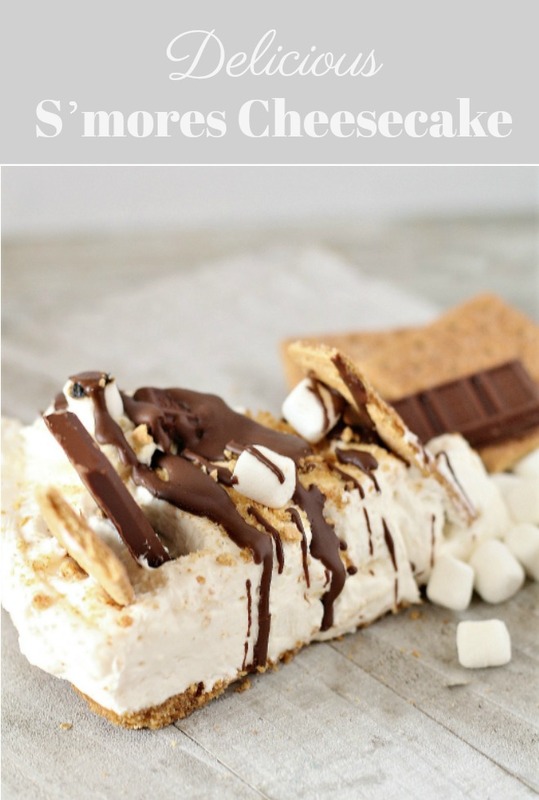 I’ve got an easy no bake S’mores Cheesecake recipe for you today, filled with gooey marshmallows, delicious chocolate and crunchy graham crackers all in a creamy cheesecake filling! YUMMY! Start by placing your cream cheese, sugar, and marshmallow ice cream topping into a large mixing bowl and mix with a hand mixer until smooth, and set aside. Next place 2 packages of graham crackers into your food processor and blend until fine. Add in melted butter gradually, blending after each tablespoon, until it forms a wet sand consistency. Pour crumb mixture into the bottom of a cheesecake pan, and press down evenly to form crust. Add your whip cream to your cheesecake batter and blend on high until smooth. 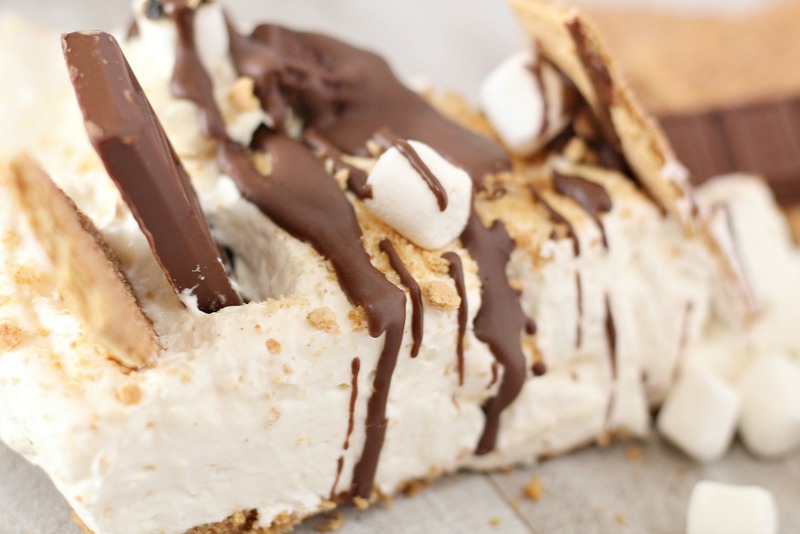 Pour your mini marshmallows into your cheesecake batter and fold until mixed well. Pour batter over crust and smooth out evenly. Place in refrigerator for 2 hour and let set. 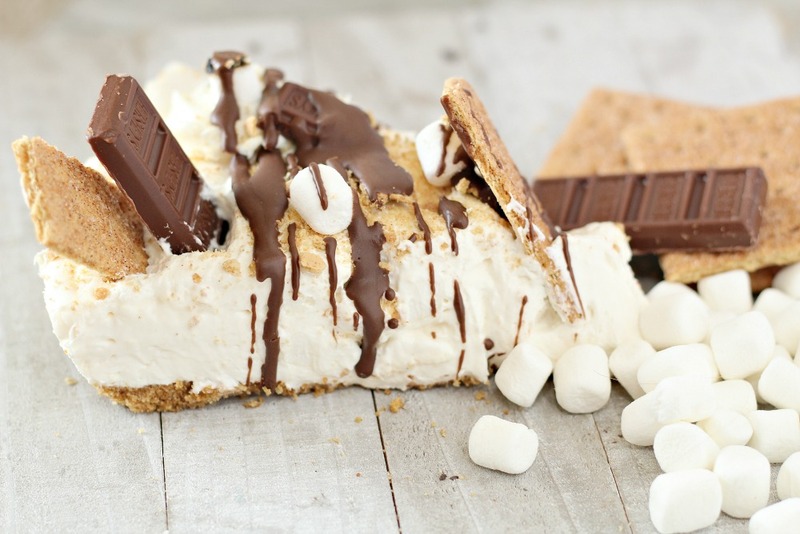 Remove from fridge and decorate with icing, Hershey bars, and left over graham crackers, as desired. Drizzle with magic shell fudge if desired. A bite of this cheesecake is pure heaven, smooth and creamy and completely irresistible. Grab a fork and join me, no campfire required! Sounds sooooo good and easy! Is it 2 1/2 stacks of graham crackers from a box? And is the 16 oz. of whip cream Cool Whip?